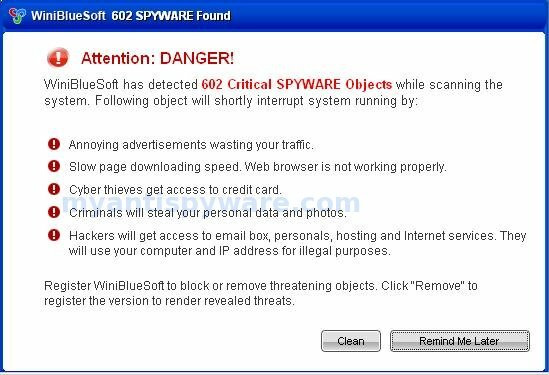 WiniBlueSoft is a rogue antispyware program that uses fake alerts and false positives to trick you into buying the software. The rogue is distributed through the use trojans. During installation, WiniBlueSoft configures itself to run automatically every time, when you start your computer. Once running, it will scan your computer and reports false or exaggerated system security threats on the computer that cannot be removed unless you first purchase the software. In addition the program creates many files in the C:\Windows and C:\Windows\System32 folders. These files during the scan will determine as trojans and spyware. While WiniBlueSoft is running your computer will display fake Windows Security Center that will recommend you register WiniBlueSoft and fake security alerts from your Windows taskbar. Please ignore these alerts. Use the free instructions below to remove WiniBlueSoft and any associated malware from your computer. This was the best solution. I searched everywhere and this finally worked, for real. Thank you so much, that Winbluesoft was really making me mad.